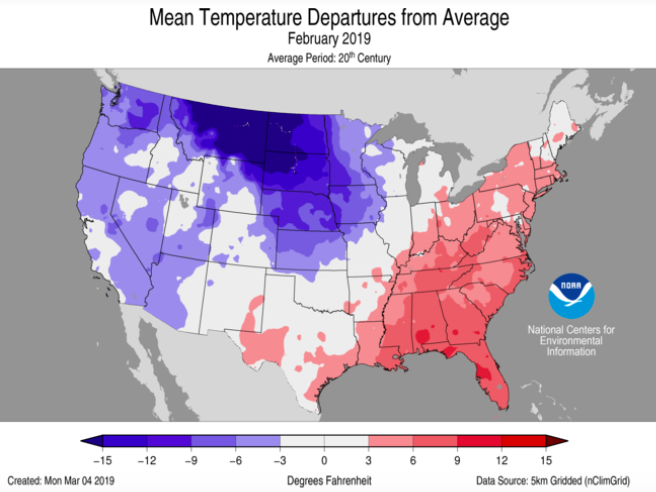 Last year's wet fall and cold November were followed by a mild December, and then a polar vortex dominated the last part of winter, yielding overall below-normal air and soil temperatures across much of the Midwest. 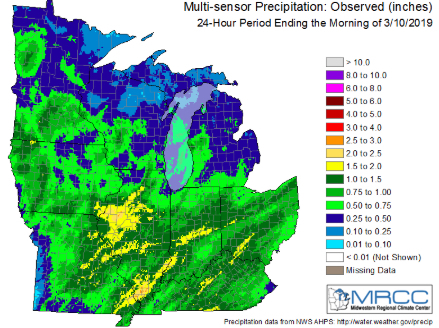 These wet, frigid conditions have resulted in substantial flooding in areas of the Corn Belt, which unfortunately means spring planting could be a washout for some farmers, and difficult for others. And for those who are able to plant, many will face obstacles caused by the colder and wetter than normal soils. Record-breaking flooding has occurred across the lower Missouri River Basin, caused in part by a stormy March that brought heavy rainfall and melting snow to already saturated soils. The northern Plains is being affected by a heavy snowpack that is expected to continue to cause flooding issues throughout the spring. 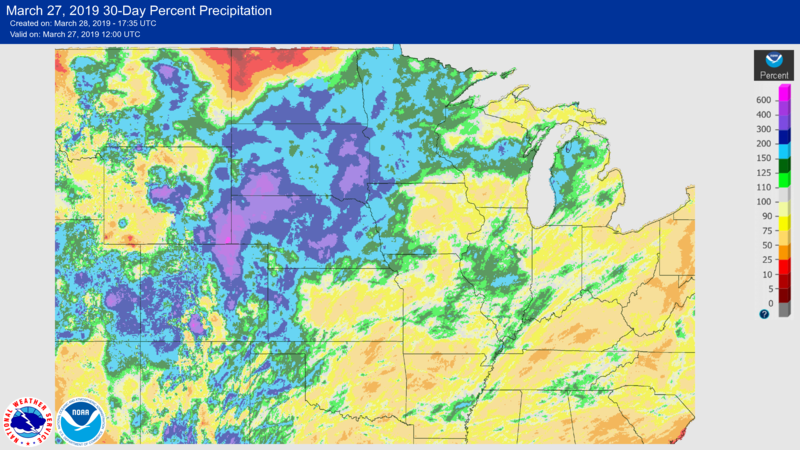 Specifically, parts of Nebraska, North and South Dakota, Iowa and Missouri are already experiencing devastating effects from these flood waters with some areas recording rainfall 500 percent above normal during March. In all, an estimated one million acres of U.S. farmland have been flooded and will likely reduce corn, soybean and wheat production this year. Farmers in these affected areas are continuing to monitor conditions to determine if planting is a possibility and, if so, what it means for their planting and input strategies. For the Midwest farmers who will be able to plant this season, unique challenges still remain. Many growers, unable to get into their fields, are now behind on their nitrogen and tillage plans as spring planting approaches. Climate Field Research Manager Charlie Beeler helps farmers enhance their operations through digital farming resources. Staying alert and adapting to changing field conditions will be key to 2019 planting says Field Research Manager Charlie Beeler. What are some of the reasons for these colder-and-wetter-than-normal soil conditions and what will it mean for farmers as planting draws closer? 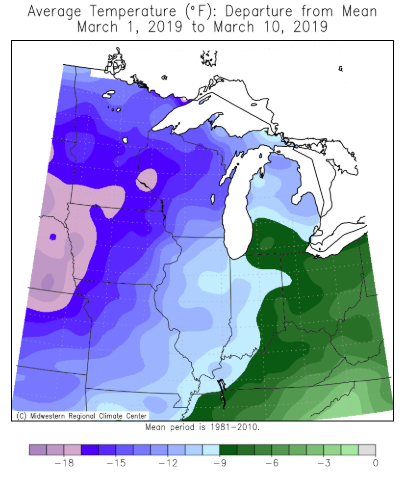 Following one of the wettest years in Midwestern history, including near-record fall saturation that delayed harvest for many growers and prevented some fall fertility and tillage plans, farmers have also faced a colder-than-normal winter across most of the Corn Belt. 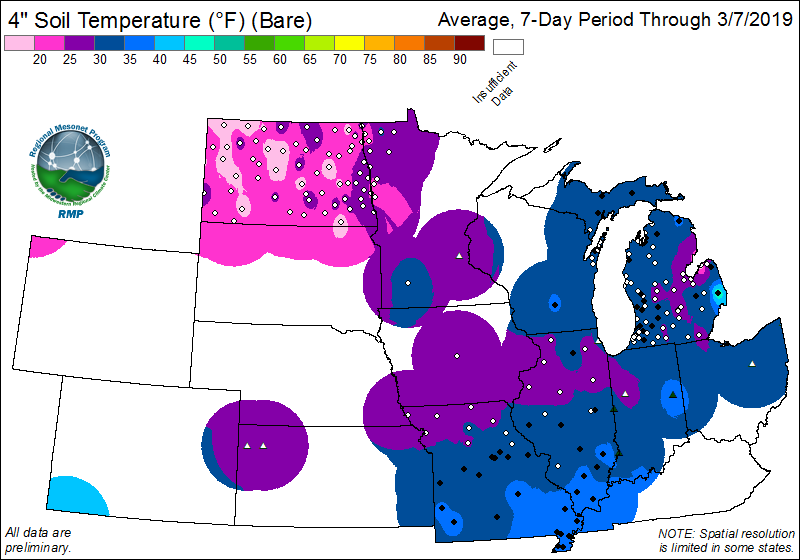 Some of the Midwest experienced well-below normal temperatures throughout February and into March. 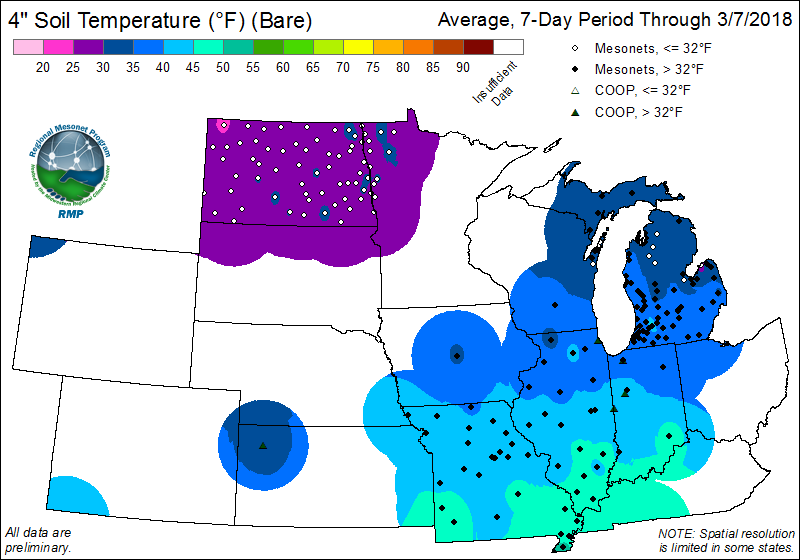 March began with extreme temperatures during the first week of meteorological spring, with most of the western Midwest 10 degrees Fahrenheit or more below normal, lower Michigan, Ohio and Kentucky six to 10 degrees below normal, and parts of western Iowa, southern Minnesota and northwestern Wisconsin more than 15 degrees below average. Major precipitation has been a factor as well. 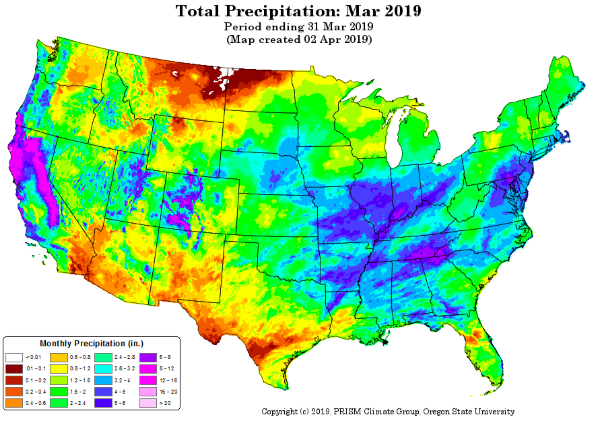 For example, this same period in March also included above-average precipitation with rainfall on March 10, breaking more than 150 daily precipitation records. Substantial precipitation was recorded throughout the U.S. during the month. 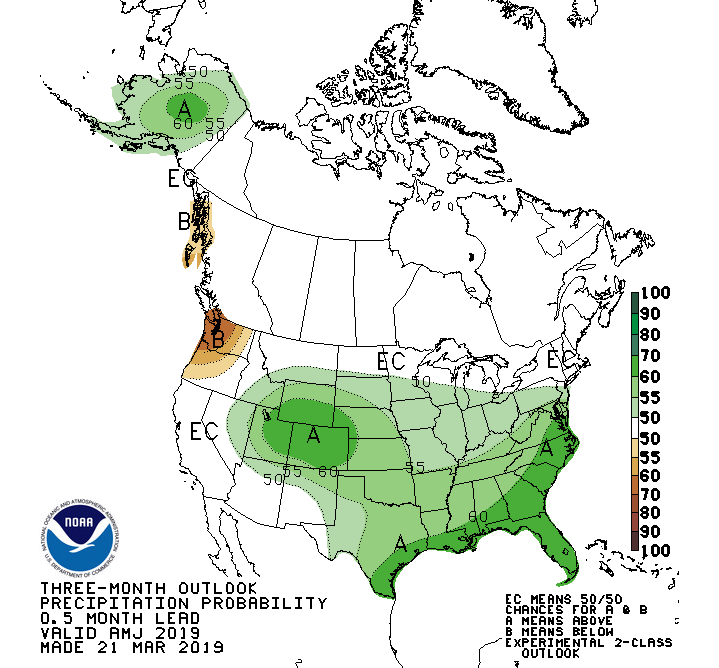 Unfortunately for many farmers, the projected forecast is for below normal temperatures and continued wetter than normal conditions through April, May and June. Not surprisingly, this Midwestern weather has also resulted in below-normal soil temperatures throughout much of the Corn Belt. For example, the first week of March saw average soil temperatures in central Iowa almost 10 degrees lower than the same time period last year, with Missouri and Illinois soil temperatures between five to 10 degrees cooler than the same timeframe in 2018. 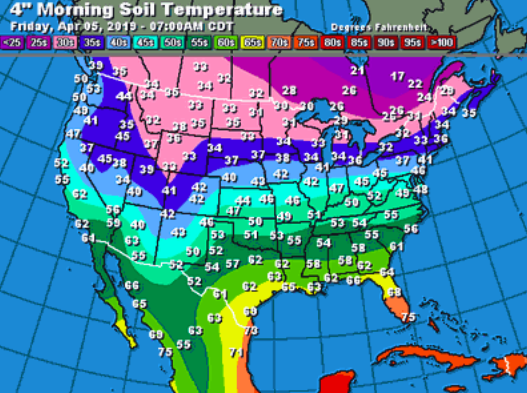 Lower-than-normal temperatures can lead to deeper freezing beneath the soil surface, and this cold soil also tends to dry out slowly since water has a higher heat capacity than soil mineral materials. In addition, we can expect to see a slower evaporation of water from the soil surface and a slower infiltration through the soil profile due to low temperatures. In short, fields will continue to be cold and wet, at least over the next few weeks. Farmers who were able to practice fall fertility should monitor for the possibility of diminishing nitrogen levels caused by leaching, the loss of soluble minerals and inputs caused by heavy rainfall. However, these conditions can offer benefits to farmers are well. The cold soils can help to keep any fall-applied nitrogen from volatizing during the winter and help to reduce loss of anhydrous. In addition, the extreme cold may also help to reduce the survival rate of some insects and crop diseases during the following growing season. Typically a freeze/thaw cycle of water can help to reduce compaction as ice crystals split apart the soil while warmer temperatures help to soften it. 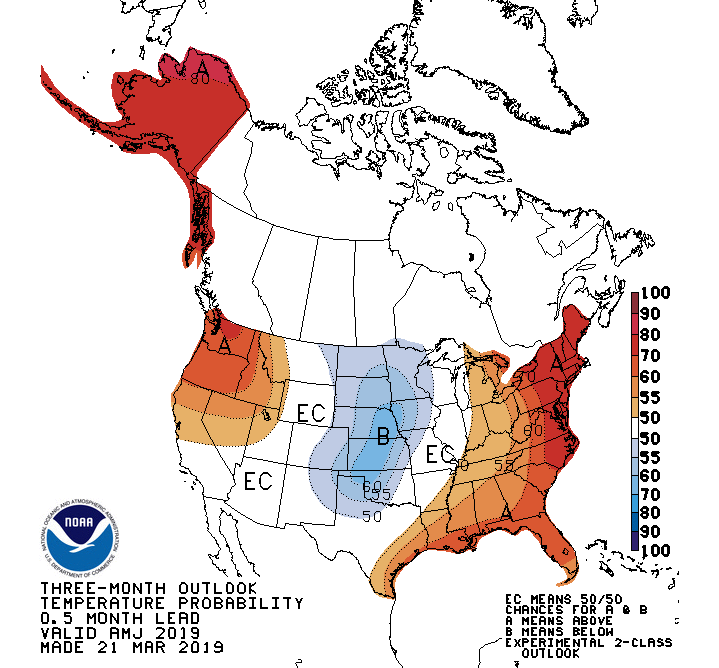 While this process has occurred in some areas, other parts of the Midwest have seen little evidence of this, and projected cool temperatures through the end of March may delay this process – and planting schedules. Farmers may also risk compaction issues if they bring heavy equipment into their fields before the ground is dry enough to work. With indications that planting may be delayed, Beeler says that as challenging as it may seem, farmers should consider viewing all of the variables as an opportunity to explore new ideas and approaches – and digital farming can help. FieldView™ side-by-side maps allow you to compare critical data layers in your field, including application rates and more. Most of all, Beeler says he is advising the farmers he works with to be as patient as possible while they wait for more favorable planting conditions. “It’s going to be a compressed spring and once it is dry enough to plant, things will have to move quickly.” Beeler says that FieldView rainfall reporting can help farmers stay up to date with field conditions to determine when they are workable. *Maps courtesy of Midwestern Regional Climate Center. 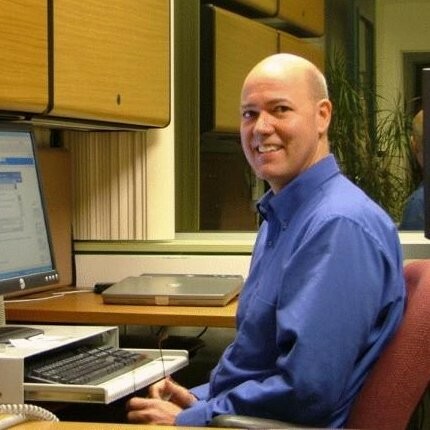 Brad Colman directs weather strategy for The Climate Corporation and Bayer Crop Sciences and works closely with weather scientists at The Climate Corporation who develop and apply technologies to help farmers understand and plan for weather and field conditions. He holds a Sc.D. in atmospheric science from the Massachusetts Institute of Technology. 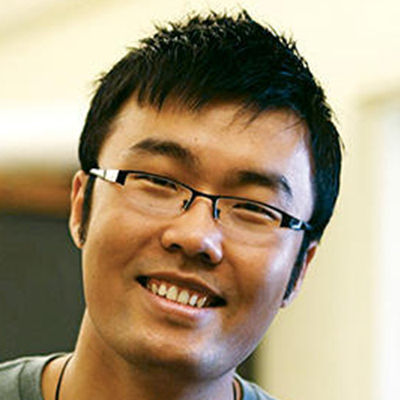 Ziru Liu is a senior sensor scientist at The Climate Corporation and works on high resolution soil and environmental characterizations with proximal and remote sensing technologies. He partners with Climate data scientists to derive insights from data layers to help farmers understand the variability in their fields. Ziru earned a Ph.D. in soil science from Washington State University.